Lighting designers, like sailors, live away from their families and homes, sharing war stories over a glass, as the legendary old navigators told fantastic tales of their voyages through dreamlike waters. One such “captain”, Jean-Philippe Bourdon, is the real deal, widely lauded for his professionalism and experience. We met with him at the Zenith in Toulouse, in the South of France, the venue for the 2017 edition of a seven-concert series given by Les Enfoirés (The Bastards), an entertainment troupe of French pop artists. 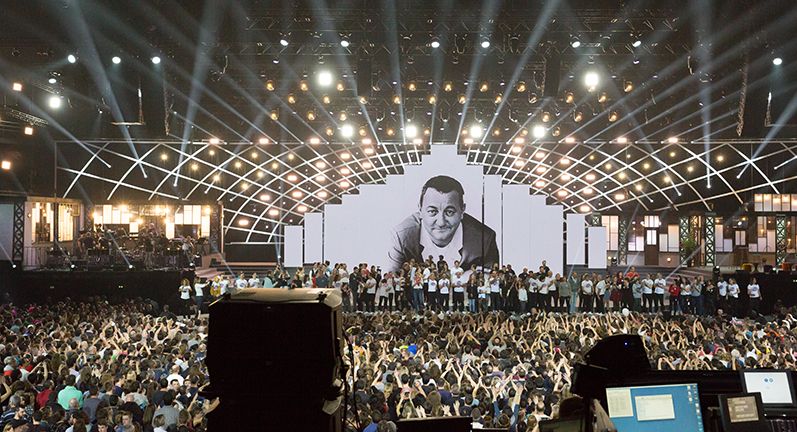 Les Enfoirés perform annually under the aegis of the Les Restos du Cœur (Restaurants of Love), a charity organisation created by the late French comedian and satirist Coluche. 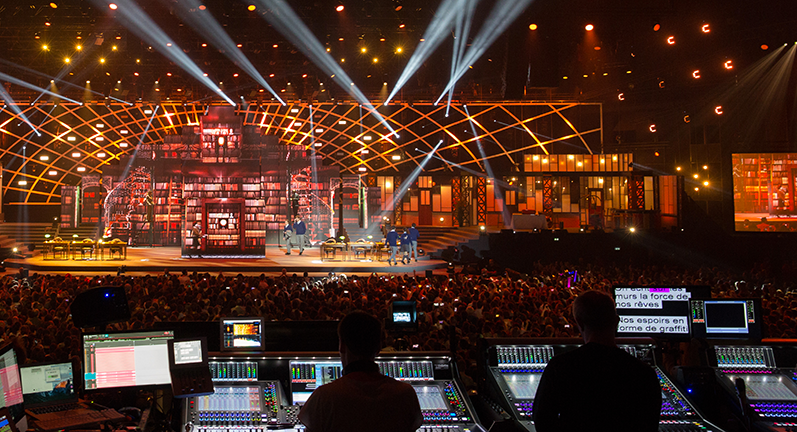 The concerts are recorded for broadcast over French network television and subsequent distribution on CD and DVD. 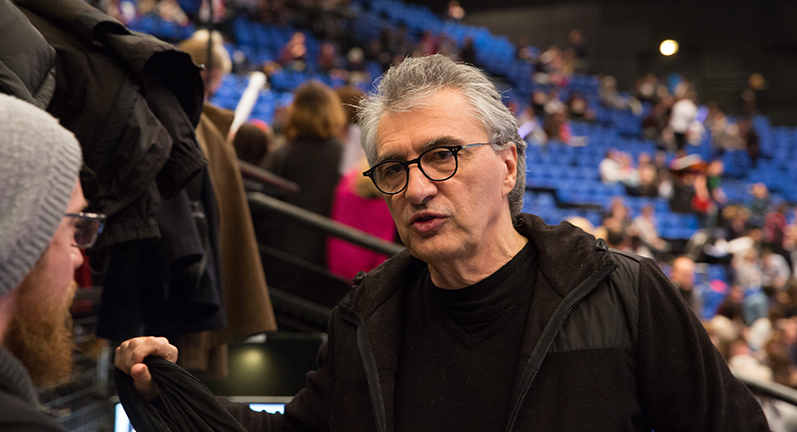 Jean-Philippe Bourdon, one of France’s most feted directors of photography, has been lighting captain for these concerts since 2000. For this year’s edition, he chose the latest luminaires from Ayrton: MagicPanel™FX, MagicBurst™ and MagicDot™R. 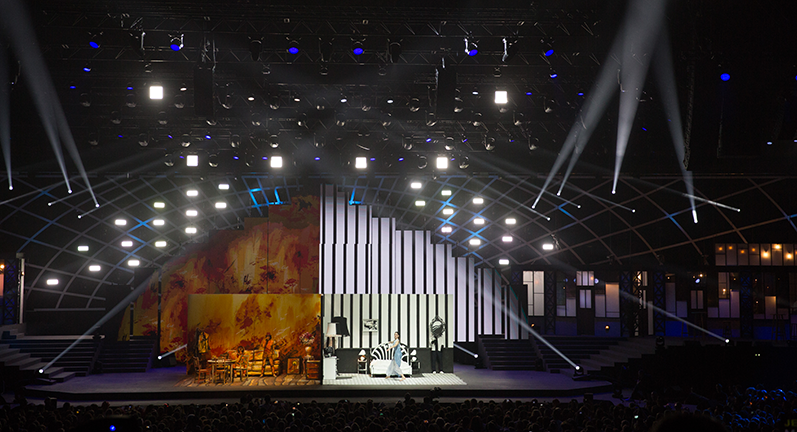 The set was immense, almost 50 meters wide, divided into three parts: a centre hexagonal stage for the artists framed by two raised platform stages, one for the orchestra, the other for a “talk” stage. 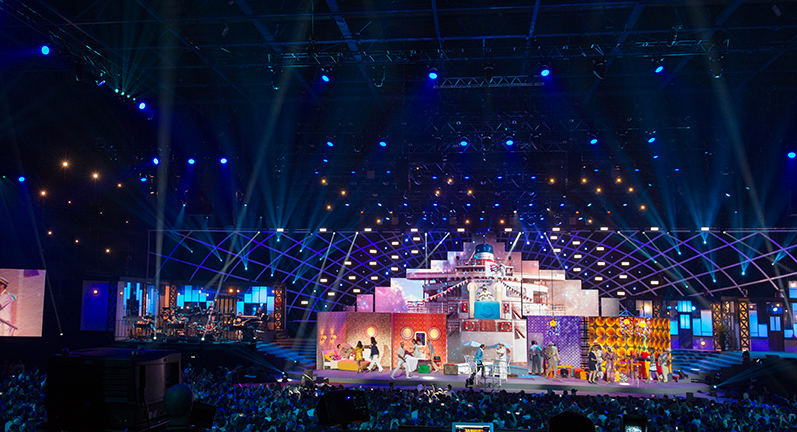 Upstage was a video wall in the form of a nine-metre high Inca pyramid. The backdrop was an infinity cyclorama. A curved trellis spanned the entire width and height of the theatre, conjuring an image of a giant, unfolded world map striated with meridians and parallels – no continents, just one continuous ocean and hundreds of sparkling islands. This phenomenal construction formed the basic matrices for the lighting kit. The most visible part of the gear was nested in the mesh of the décor. 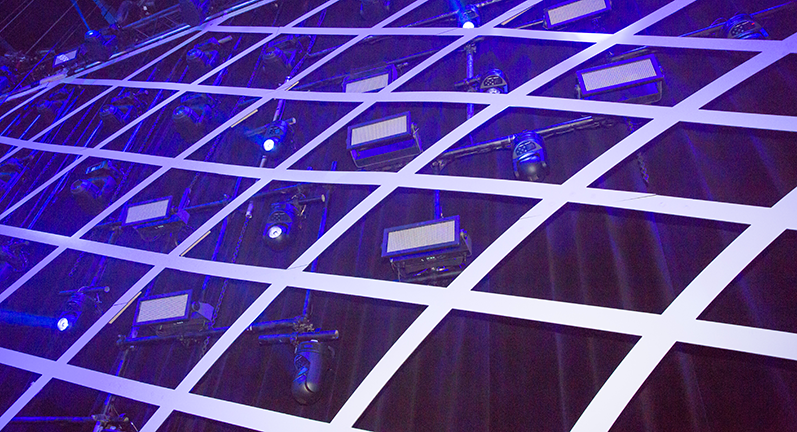 This mosaic, which gave depth to the central stage, held several MagicDot™R fixtures which could operate effectively in close proximity to alternating strobes. The Ayrton luminaires, appearing as balls of shimmering light suspended in the air, projected their beams through the haze of the décor. 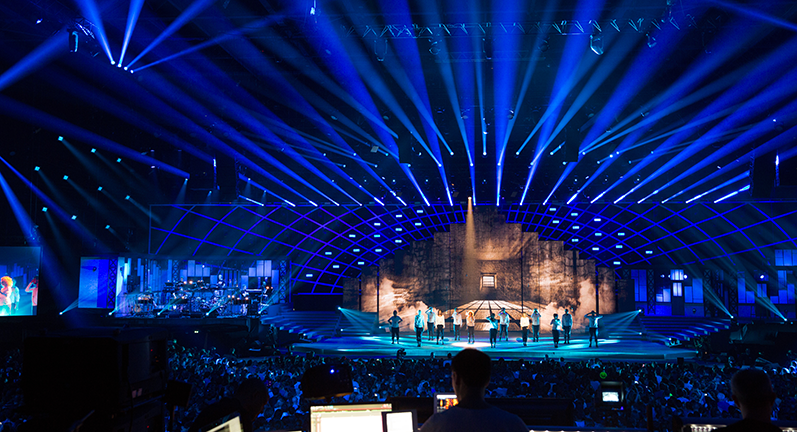 An impressive number of beams provided continuous light at the top and the outer edges of the set, highlighting the house and the stage following the geometric shapes designed by Bourdon. To illuminate the web of steel composing this colossal map, three trusses of wash lights were hung on two-meter spacing. Seven main lighting trusses carried Blade fixtures. 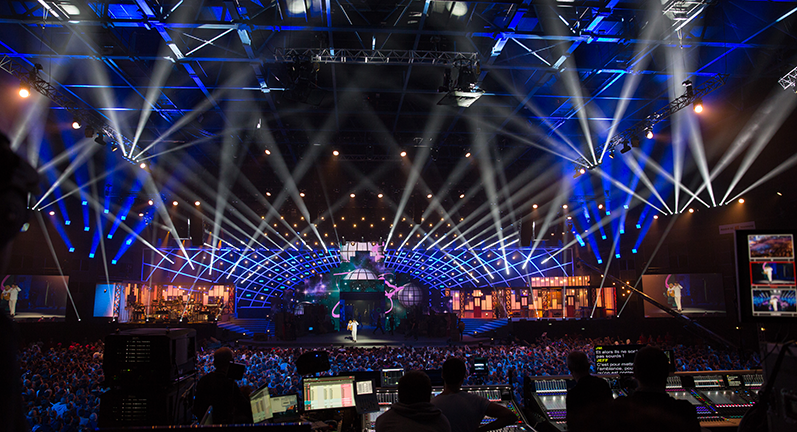 They were key to the television broadcast, front lighting the artists, providing back light, and illuminating dozens of sets and accessories for each stage. 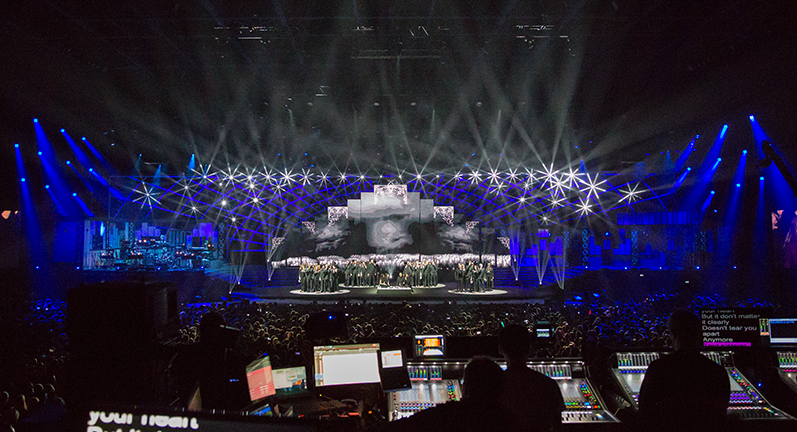 Twelve MagicBurst™ luminaires, Ayrton’s unique graphic strobe units, were distributed throughout the rafters – each a matrix of 64 motorised LED strobes in continuous rotation. These blinding panels were standing by to dazzle us. Also on the watch were two racks of 20 Ayrton’s new MagicPanel™FX fixtures, for use as sidelights. This is the exciting new iteration of MagicPanel™, with unique squared off 25-emitter optics and 3.6° to 53° zoom. Able to morph from an extremely bright light shaft into a versatile wash luminaire, this unit is like a character actor, perfectly capable of playing the role of audience blinder, graphical panel, wash light or LED strobe. Continuous rotation is but one of its many talents. On the “bridge” of this huge ocean liner of light, were two GrandMA 2 lighting consoles and a battery of monitors. Technicians were busy preparing the scenes for that evening. 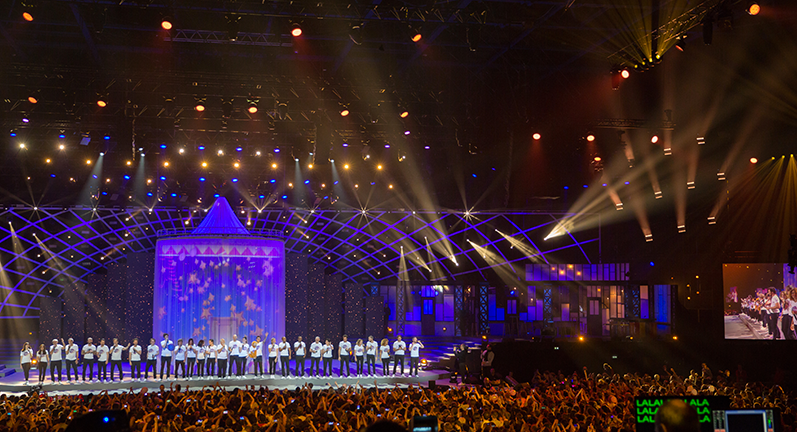 The graphics operators ran back and forth, loading the Smode media-server in support of dozens of LED screens upstage. Squeezed in between a GrandMA console and the video monitors, sat Jean-Philippe Bourdon in front of his forever-classic Jester console. He greeted us with a wide smile. 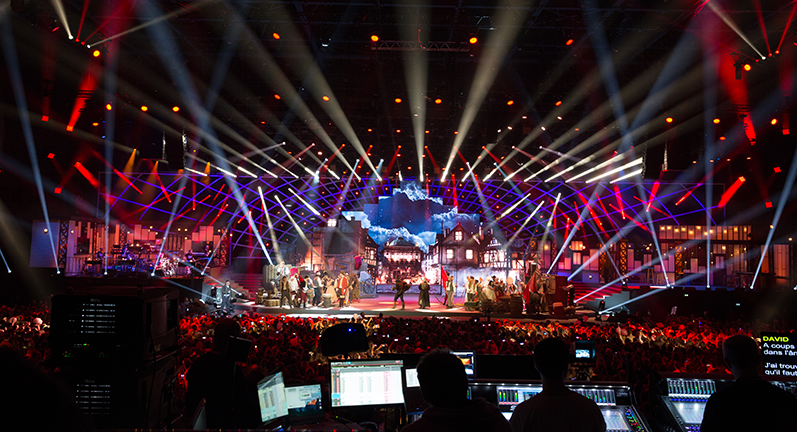 SLU: To begin, can you tell us what process you follow when designing the lighting for a televised production like Les Enfoirés? JPB: First off, I’m more interested in the story and performance than in the technical issues of the video shoot. I know my video craft well enough by now so, once I’ve established a solid basis for the show, I can adjust accordingly. I have to keep in mind all the camera angles, plus lighting the audience area, which requires me to have lots of equipment in the house and, of course, followspots. Usually I start off with a big mess. I’ve got loads of ideas, so I put stuff all over. Then I eliminate as I position and hang the equipment. We arrived here at the Zénith in Toulouse with much too much gear—we were eight tons over! So we had to do some serious housekeeping (smiles). Since my design concept is never set in stone, I give myself leeway to change or move fixtures around during setup—just in case I make a mistake. It’s not easy for the other guys, but I’m fortunate enough to have a crew with a good attitude (laughs)! 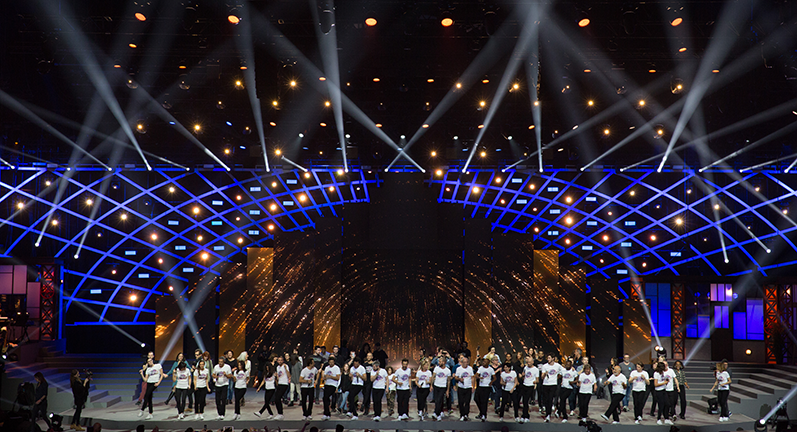 SLU: For Les Enfoirés show, what are your options and limitations? JPB: I decide everything – as far as fixtures and how they are set up. The design is completely free in the sense that nobody imposes any artistic or technical limits on what I do—only financial, of course. There are, however, a lot of constraints in accommodating the sets, which take up quite a bit of space and, since this isn’t a show for one artist in particular, but for a team with a wide variety of scenes, you have to implement a system with as many options as possible to be able to switch from an intimate moment to a heavily lit production number, and from different musical styles over to comedy. You want the maximum number of “coloured pencils” you can have, meaning a lot of fixtures to cover this set, which is fifty-meters wide. It’s much different from a more specifically targeted show, with a single atmosphere. Finally, there are the limitations of television. We have 17 cameras, which is really uncommon, so I have to deploy gear to cover all the angles. We’re given a lot of freedom, but for it to be cohesive, you have to know how to work with everybody and adapt to the requirements of the performances… and of television. For this shoot, we’ve planned way ahead to make sure the equipment is available. SLU: Do you have a special relationship with Ayrton? We try to invent new ways to use them – and that’s the whole point. They’re unique, but they always meet the basic needs. Ayrton’s specialty is LED, and their concepts and execution are at the highest level… I really like the company’s whole product line. Plus, with a small outfit like Ayrton, we can stay in close contact and propose ideas. We can have lunch with them and talk. With big companies, there’s no way. JPB: Exactly. I was lucky enough to get twenty of the MagicPanel™FX units – one of Ayrton’s newest products – to try them out. I didn’t feel like scattering them in the rig, and I didn’t want to just put up a big matrix in the middle – it would have been hard to embed them into the hoops of centre décor. But the luminaires worked out perfectly in two side areas that were really complicated to set up. 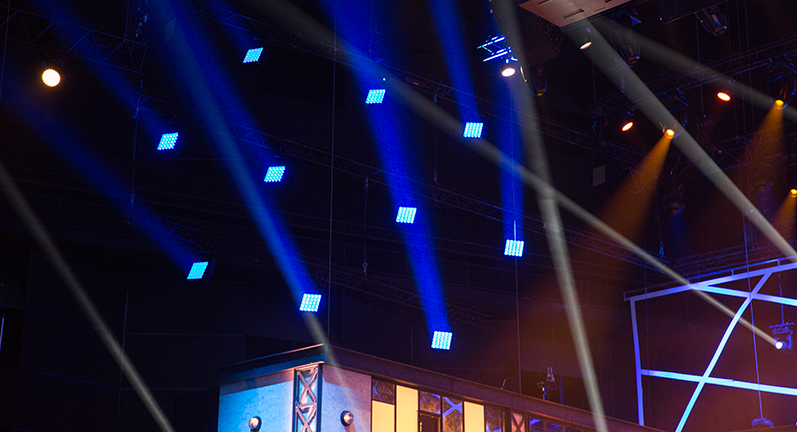 Where I would have needed a lot of projectors, Ten MagicPanel™FX units filled those spaces perfectly. I use them for effects, as pixels, but also as powerful sidelights to hit the stage. I love the zoom, which gives me a lot of options. 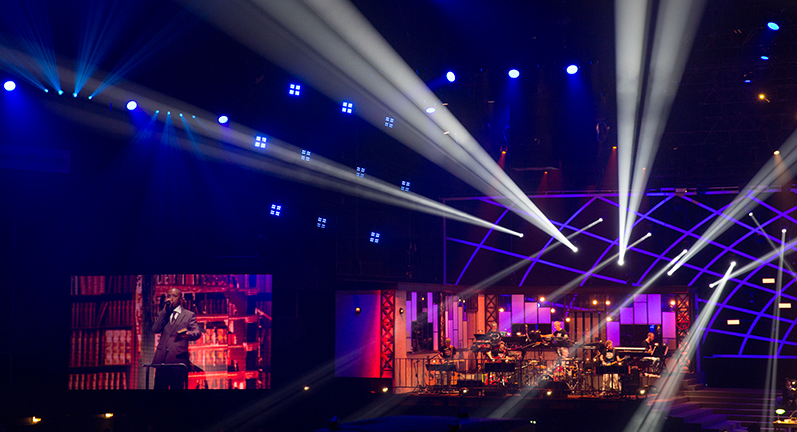 The concept of widening the beams and varying the focus on the arrays allows the whole audience to see the same thing. They don’t just favour the angle from the lighting desk. I look forward to using this product again. JPB: We have 12 of them positioned all around the theatre, and I’m using them at full power… I was a bit scared at first because during the demonstrations, after they came up, I couldn’t see anything else – I was all but ready to quit my job. But, here at the Zénith, with all Haze and the high ceiling and the rest of the gear, we’re using them with no problem. Full power is just right! The MagicBurst white balance is pretty nice – not as cold as other LED strobes that we’ve seen, and the unit is very modular, with a very wide matrix that produces good lighting. I haven’t used the moving-head features much, just in two or three positions, moving from the stage to the audience… This show wasn’t the right context for the continuous rotation. 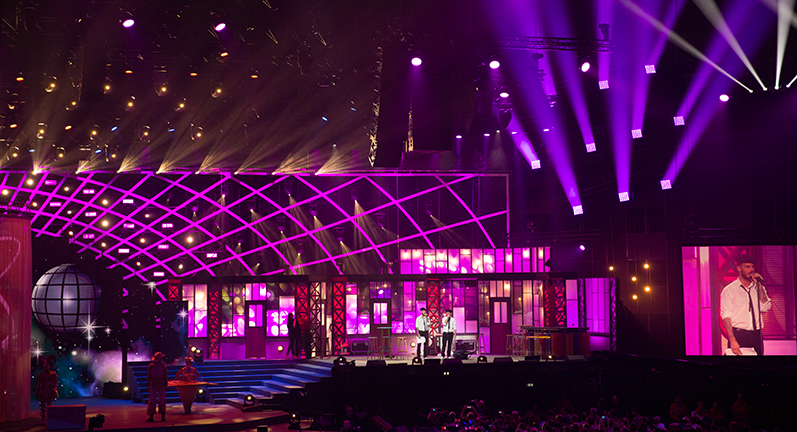 SLU: How did you deal with this huge set, and upstage with all the narrow spaces and curves? JPB: There is very little room behind it. We have clearance of less than 40 centimetres between the rear curtain and the scenery trellis. So, I’ve slipped in quite a few MagicDot™R units, which have the advantage of fitting in anywhere and being lightweight, and they stand up to the big light projectors. I would have loved to use the new MagicDot™SX luminaires. With their zoom they’d have been perfect, but they weren’t available yet. All in all, I have about 750 moving heads, plus about a hundred conventional fixtures that are for specific focuses. I don’t differentiate front lights from other fixtures in order to do a special effect, or vice-versa. It’s made life easy for my programmers / operators, especially considering the schedule we had: only one day of pre-production, then two and a half days of setup / programming to deliver almost twenty scenes and fifteen set-change interludes for the show… so, we’ve been busy (smiles)! SLU: So the lighting rig is made up of some very versatile fixtures, right? JPB: I can’t afford to have any equipment that’s too specialised. Each fixture has to pull its weight, like the Blade or the MagicPanel™FX, so that I can create completely different looks. Then again, I don’t like hybrid units that can do a little bit of everything—wash light, beam, spot—but can’t do anything very well. I prefer versatile fixtures with a good focal length and zoom ratio. SLU: Do you encounter any problems combining fixtures from various manufacturers especially with colour mixing? JPB: CYM colour mixing (Editor’s note: subtracting from a white source, unlike the additive colour effect of LEDs) is disappearing from the market and giving way to LED spotlights, so I’m having a few issues. With CYM units we always manage to connect the colours, but with LED units, even using high-performance fixtures like Ayrton’s with Osram emitters– obtaining a good clean white can be a bit complicated. These are the top of the line luminaires on the market, meaning some of the most expensive (laughs), but we still can have problems with the incomplete wave spectra of white LEDs; it gets better when we add just a bit of colour. SLU: Can you tell us what problems you’ve had with additive-colour RGB LEDs? JPB: The colours generated by LEDs can be very saturated, which is not the case with discharge fixtures and these chips emit both at the very high end of the spectrum, the infrared, as well as down in the ultraviolet. But video cameras don’t have the ability to capture an intensity level that exceeds their sensors’ capacity. And as soon as we reach that threshold, we lose information in the image. So we have to significantly reduce the light level to achieve detail, which causes some pretty weird situations with fixtures set to 20% red or Congo red. You don’t see the effect with the naked eye, but you see it in video. The digital imaging technicians can’t do much about it, except play with the gamma. The signal is already normalized to 100% saturation, and the new digital cameras have very little tolerance, so if you exceed capacity you end up with poor pixel resolution. SLU: Do you have fewer colour mixing problems with the automatic units using subtractive CMY? JPB: It’s the eternal debate over colour mixing. The latest trend is to use very dense dichroic filters that yield saturated mixtures with fewer pastel shades. And some of the lamps now operate at a very high colour temperature. So, while it improves performance, it’s at 8,000ºK and you lose all the warmth. 6,000ºK should be the maximum. SLU: How much control do you have during the show? JPB: It’s become a habit: I let the board operators take care of the effects and the music. We have a common remote (Editor’s note: a grandMA 2 fader wing, which follows the pages on the console, and a traditional console that remains connected to the grandMA. 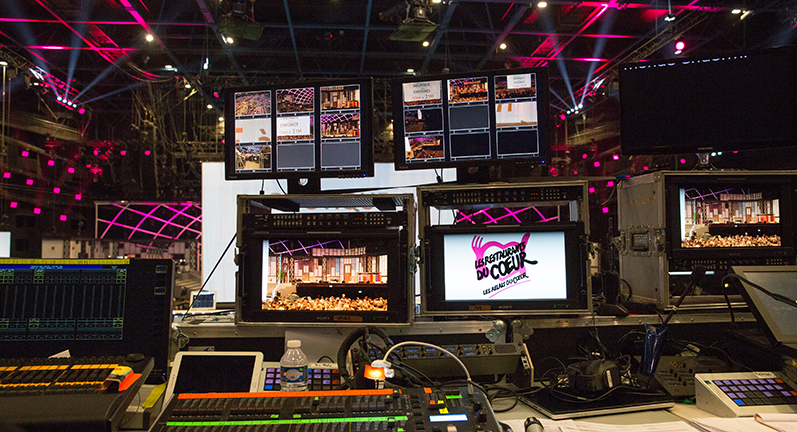 I use that to run the front lights, the back lights and the audience lighting… I control the scene separation. My board operators follow the rhythm of the music, and their roles don’t conflict. We try to keep our minds—and our hearts—focused on the stage. SLU: Jean-Philippe, of all your past projects, is there one you are especially proud of? JPB: Taratata was a big part of my past (Editor’s note: A French TV program broadcasting live pop-rock music in 1993.). At that time, the show was one of a kind. We worked with no constraints. We couldn’t really get away with that today. Now TV shows all apply the same formula, with parameters set by the “Anglo-Saxon” world. 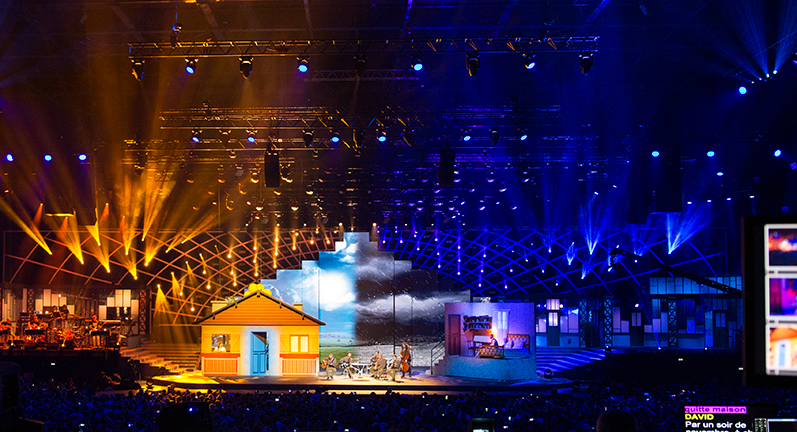 Les Enfoirés show was a good long voyage. Over a period of five hours, one scene followed the next. It was leisure cruise highlighted by group performances, with the troupe leaping around the gargantuan set, interspersed with more intimate moments of song. There were also light-hearted interludes of improvisation, just long enough to let stagehands change sets. Actors forgetting dialog or improvising their lines were all part of the charm, especially when it got a laugh out of the audience. The important thing, after this week of production, was to create a polished performance that, when ultimately broadcast, would be purged of all imperfections. Bourdon made full use of his lighting gear that evening. He supported and nourished each scene individually, with all the luminaires at his command, and had the 17 camera operators cover all the angles. Those used to live concerts might have been surprised by the way he showcased the performers. The video cameras require that the followspots be filtered and adjusted as precisely as possible to suit the atmosphere and flatter to each actor. As a result, the faces always appear on screen perfectly lit and detailed against a magnificent background. MagicPanel™FX is without a doubt the operator’s favourite new plaything. Its countless and unique special effects allow them to be ever more inventive. The amazing versatility of this chameleon-like luminaire makes it a perfect tool for creative minds. After a long night, we finally arrived at the end of our voyage. The production spared no opportunity to delight, with a rich and elaborate design, remarkable display of images, and painstaking work on stage and around the audience. Jean-Philippe Bourdon, assisted by his devoted crew, calmly and serenely manoeuvred his fleet of fixtures. His style was graphic and meticulous. He tastefully created many incredibly lavish scenes, always focused on the final effect of the visuals. This voyage was a marvellous shared experience, personally and artistically speaking.